Apple (AAPL) was a stock I bought earlier this year after watching it fall from $700 to $450. My thesis at the time was that it was an over reaction to slowing sales and the drop in management skill from Steve Jobs to Tim Cook. Based on valuation, I felt it couldnt go much lower, and I think it will take a lot for those Apple users in the Apple ecosystem to switch to Android or Windows phone. Apple for the most part has a captive user base. I first bought in at $450, then bought some more when it hit $440, and then some more at $420. I felt I was just a little early at $450, that my thesis was still correct and it will bounce up. Since then, Apple has been bouncing between $400 and $450, and today I finally decided to bail out and I sold my position at $455. Why did I sell? I felt my thesis crumbling. Apple first hit $450 in January, and the anticipated reversal of overreaction didn’t materialize. Two earnings reports have come out since then, confirming revenue growth is slowing, but the stock is still pretty cheap on a valuation basis. However – I am not an Apple guy – I own no Apple equipment and so I lack the first hand ‘feel’ of how Apples new products are doing. The other problem is Apple has a huge market cap, meaning a large number of investors, so I have to believe there are a large number of investors who know more about Apple than I do – and they do not appear to be clamoring to argue the stock is undervalued. 1. I feel good that as the price of Apple dropped I stuck to my thesis and bought some more. Unfortunately,doubt crept in when it hit $400 and even though I felt I should buy more I couldn’t pull the trigger. 2. I feel good that I was able to make a decision to get out when i decided my thesis may not be correct. It is harder to know when to sell then when to buy (See my other lesson in investing for another example). I still think it was a low risk decision to buy the stock because it was so cheap, but I now don’t have the confidence that it will bounce back quickly. Again, not being an Apple guy handicaps me in analyzing Apple products. It may be the wrong decision, and I may just have gotten out to early before my thesis took hold, but I don’t feel my decision was based on emotion – fear or greed. So after all was said and done, I got out of it with a slight profit, though the profit probably under performed the S&P 500 for the period. I still feel Apple is cheap right now. If it drops to $400 again without significant bad news, I may be tempted to buy again – but for now I will be on the sidelines. In December 2012 I had a post about the coming rise of the Google Chomebook. It is starting to to look like the Chromebook is gaining traction. Quoting from the article, “Chromebooks have in just the past eight months snagged 20 percent to 25 percent of the U.S. market for laptops that cost less than $300”. I think the sub $300 laptop is an important market – the alternative to a tablet. I see many households having both a tablet and a laptop – a tablet is great for casual internet browsing , and a cheap laptop is great for responding to emails or lightweight content creating (blog posts, writing news articles etc). Is Windows 8 to blame for this? Perhaps consumers, faced with learning the new look Windows, are open to exploring alternatives to Windows. It will be interesting to watch to see if the Chromebook can continue to eat into the Windows dominance from the bottom up. Another article here discussing how the Fed’s Quantitative Easing was a boondoggle – leading me to question whether or not this policy was just a stealth bank bailout. 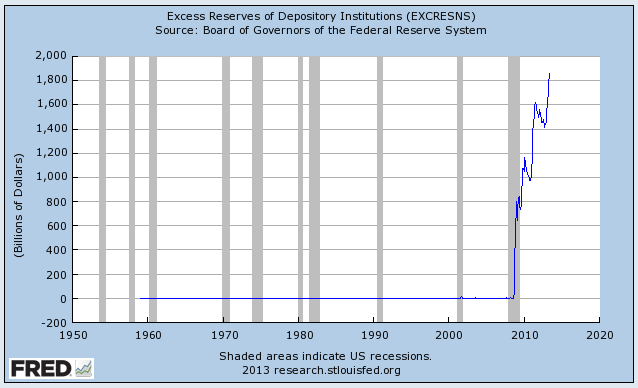 The authors point is that all the money the Fed pumped into the economy ended up sitting at the banks as ‘excess reserves’. Why? because the Fed pays interest on excessive reserves, acting as a disincentive for banks to pump the money into the economy. This chart pretty much proves the point that all the money pumped into the economy by the Fed over the last few years has just ended up sitting at the bank. As of 6/27/13, the bank is paid 1/4 % on all interest reserves – which only seems like a lot when you see thats 1.8 Trillion in excess reserves. The Bernanke Fed is now facing a $1.863 trillion time bomb, they helped to create, of excess reserves in the private banking system. If rates of interest on income earning assets (including bank loans to consumers and businesses) rise, the Fed will have to pay the banks more interest to hold their excess reserves. At the current level of the time bomb, raising interest paid to banks on excess reserves would give the banks $18.6 billion a year at 1 percent interest, $55.9 billion a year at 3 percent interest and $93.2 billion a year at 5 percent interest. Because of concentration in banking, it is unlikely that much of the interest would be passed on to depositors. Bank stockholders would receive much of these large bonuses from the government. In retrospect, knowing that the public would have no part of continuing to bailout the banks – was the Feds ‘Quantitative Easing’ a stealth bailout under the guise of growing the economy? I will let the reader decide.